Athina Kontou is a musician who was born to greek parents in Frankfurt, Germany and who considers both countries her home. 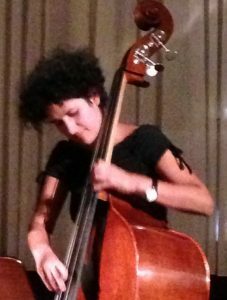 2008 she came to Leipzig to study jazz – bass at the HMT. She is an active member of the Leipzig jazz and world-music scene and plays regularly with the Johannes Bigge Trio, Autochrom, Luise Volkmanns Été Large and Karolina Trybala. In 2014 she also formed her own band in which she combines the greek folklore music with a jazz sound. In 2016 she started the collaboration with Nadja Grasselli on the projekt „HxH – Die Stadt (er)wartet“, which brought her to LMN.